RadioBro’s Marc Becnel, left, and Nathanial Long visited with potential customers at Farnborough. 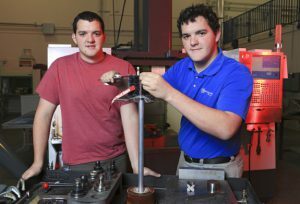 The young aerospace entrepreneurs behind Huntsville startup RadioBro Corp. are prepping for the production roll-out of their flight test data-acquisition system as they continue to pursue business connections around the world. 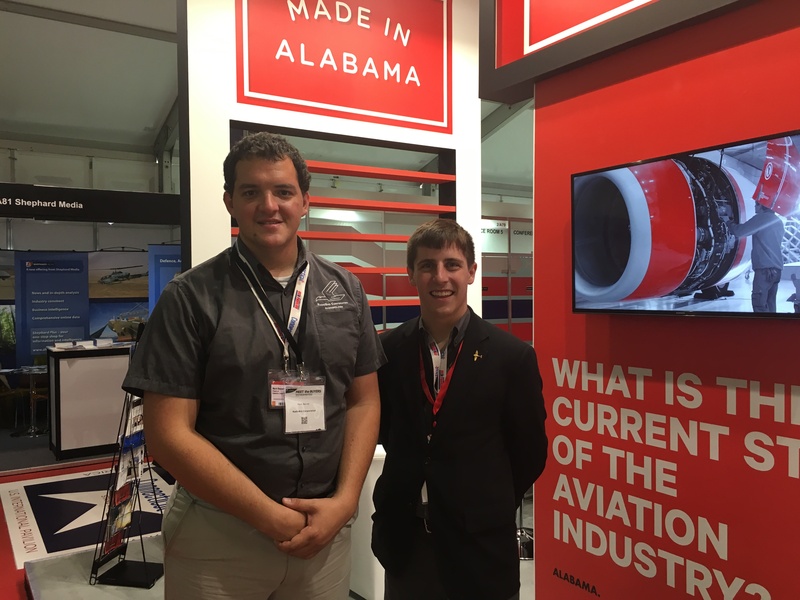 Made In Alabama, which profiled RadioBro just before last year’s Paris Air Show, caught up with company President Mark Becnel at the Farnborough International Airshow in July to get a report on the high-tech firm’s progress. Becnel, who founded RadioBro with twin brother Eric in March 2014, said he’s encouraged by developments going on at the fledgling company. The startup continues to add employees at its Alabama base and earlier this year opened an office in Bremen, Germany. A key development, he said, is the full production launch of its Cyclone instrumentation system, which records data from an aircraft test flight for certification purposes. “We’re bringing what we think is the next generation of flight test hardware to the market,” Becnel said. 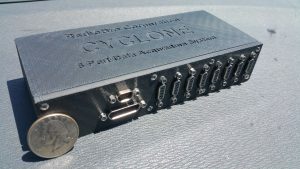 The Cyclone system has been in development since November 2014 after the Becnel brothers connected with an aviation customer in need of a data-acquisition test kit to support FAA-certification. Obtaining certification verifies that an aircraft is engineered properly and safe to operate. The Becnels took the Cyclone with them to the 2015 Paris Air Show as a first-generation concept that had flown with the customer. Twin brothers Mark, left, and Eric Becnel launched RadioBro in Madison County in late 2014. (Photo by Michael Mercier/UAH). He said RadioBro is preparing for a Cyclone production and the new hardware’s first flights by end of summer. Huntsville area production partners include STI Electronics for chip placement and Deep Blue Concepts for aluminum machining and other tasks. Becnel, who holds a master’s degree in aerospace engineering from the University of Alabama in Huntsville, said his company is taking full advantage of the skills and expertise found its high-tech hometown. While at the Farnborough Airshow, Becnel and Nathanial Long, who mans the RadioBro office in Germany, conducted meetings with several potential customers for the Cyclone system. Becnel traveled to London as part of the business development team from Huntsville, which has plenty of experience at the European air shows. “The opportunity to come to an air show like Farnborough is really special,” he said. “The people we are talking to are in a position to make decisions to do big deals, or small deals. When everyone comes to the trade show, they’re here to figure out a way to do new things or better things. “That’s a great environment for us to do business in. It’s face-to-face, handshakes, and understanding we have the right culture with the product we’re building,” he added. 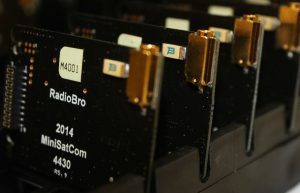 The Becnel brothers started RadioBro and designed MiniSatCom, a lightweight, powerful transceiver for small satellites. Becnel thinks the market for Cyclone is substantial and will fuel additional growth for the company whose first product was MiniSatCom, a miniature transceiver for small spacecraft designed when the twin brothers were attending UAH. “Our team back home is incredible, and hopefully with the work we generating at a show like this, we’re able to keep a profitable and growing future,” he said. “At the moment, there are 12 of us on the team. As the next year goes on, there’s a good chance we’ll double again.